Jungle Red Writers: Are appliances the new handbags? ROSEMARY HARRIS: If you blindfolded me in my own kitchen I could not tell you what brand of refrigerator, stove or microwave I have. The only reason I know I have a Bosch dishwasher is because I hate it and I'm about to replace it and its fellow appliances. And I have been drawn into uncharted territory. First off, who knew these #$%^ things were so expensive? I certainly didn't. Like airline tickets, I think they all should be under $1000. You can stop laughing now. Apparently August is a good month to buy. There are lots of sales and they like it if you buy a bunch of appliances at the same time. After all, one salesman told me, "you want them to go." I had never given much thought to whether or not my appliances "went." One got food cold, the other got food hot. That was pretty much all I asked of my appliances. Suddenly I found myself eyeing a stainless steel Viking as big and slick as an Airstream. Talk about sticker shock. I recognized a few of the other names and had a general sense of where they were in the appliance pantheon, but dang...who knew there were $15,000 refrigerators? And why? Other than size, cold is cold, right? I thought it all faintly ridiculous until Alberto, the installer came to measure the weird (of course) space where the fridge went. "It's not standard, but we can shave the cabinets. You could fit a SubZero in here." Who said I wanted one of those? And then I felt it. The twinge of..what...appliance angst? Pride in my porcelain? Was my self-worth tied to my SubZero? Will someone please stop me before I buy the Wolf stove or the Northland custom side by side? JAN BROGAN: Having once fallen for the expensive Meile dishwasher - because it had a hard water filter I thought I needed - I can tell you, it's a waste of money. It was designed for small little German plates and cups and you couldn't fit anything in it. I hated that thing so much I pulled it after five years and am happy to be back with Kitchen Aid or whatever low-rent brand I actually have. HALLIE EPHRON: We buy the cheapest appliances and are never disappointed :-) -- When we went to our local appliance store, which was roughly the size of Rhode Island, to replace our stove, EVERY STOVE in the showroom was $2,000 or more. My budget was, ahem, a LOT less. So I asked the sales guy What's the deal? All I want is four burners and an oven. He led me to a door in the back corner of the showroom (really), opened it, and VOILA there was another football-field's worth of appliances. Felt like I'd stepped through the wardrobe in the Lion, the Witch... A sea of white, all white, basic, and priced at hundreds not thousands. As you all know, I LOVE to cook, but seriously. How many of those fancy "features" do you actually use? AND magnets don't stick to stainless steel. But I keep saying no. I love our oven. Why? It's red, from the fifties, maybe, and how cool is that? Our stove is an equally unreliable gas thing that I have to keep making sure still has a lighted pilot light. But I know how it works and I understand it. As for the dishwasher. Ah. Another story. Ours flat out broke, no recourse but to replace it. And the ONLY replacement that would fit in the space is a..oh, I forget the brand. It's fabulous. Instead of a flip-down door opening, it has two drawers that pull out. So you can use both drawers, or just one. I admit. I am in love with it. It makes a lite beedle-beedle noise when you open the drawer, an it makes me so happy. DEBORAH CROMBIE: No appliance envy here. When we remodeled our kitchen in 2007, we replaced everything except the fridge, which we'd just had to replace the year before. (Hank, I have the same dishwasher. Just wait until you have to work on it. Ha ha.) We didn't go for the Sub Zero price range, though, thank goodness. And I agree with Jan--who would ever want to have people looking at what's IN your fridge? And a fridge without magnets? Please. I do love my Jenn-Air gas stove with gas oven. I like to cook and you can't beat a good gas range. We've got a little drinks fridge (clear door okay on that one) and a Sharp drawer microwave. I love the microwave, but unlike the dishwasher, we haven't had to do repairs yet. I suspect it will be a nightmare. RHYS BOWEN: Sorry, I'm a Kenmore girl. All our appliances come from Sears. 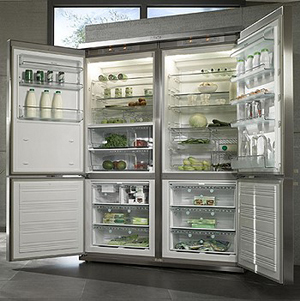 I have friends with Sub Zero fridges and they look lovely, but so what? And my brother has a stove that belongs in Gordon Ramsay's kitchen but it uses the same gas that I do. I do love my Cuisineart which is the big one, but apart from that I'm content. We did just buy a lovely new washing machine, front loader, huge capacity and it really does get things clean. However, I do confess to twinges of car envy sometimes. I buy a new Camry every four years. Reliable, good solid transportation, but part of me wants that low sleek sportscar with the rag top, or better yet the Mercedes sports car with the top that folds at the press of a button. I suppose I could afford one but the sensible side of me says WHY. JULIA SPENCER-FLEMING: Rhys, I am totally with you. When we need to replace something, we walk into Sears, pick the Kenmore that got the best rating from Consumer Reports and buy it. Sears has really reasonable delivery rates in our area as well. I have to confess, I love reading shelter magazines (Traditional Home, House Beautiful, Southern Living) and I often fantasize about having one of those fabulously retro kitchens, where all the appliances have rounded '50s corners and come with cool pastel paint jobs and chrome trim. But OMG, have you seen how much those things cost? The frugal Yankee in me can't take it. I'm not willing to pay an extra $1,000 for pretty. We're with Rhys. Whatever breaks, we call Sears. We just bought all new applicances except stove for the house we just moved into. Shopped at Sears on the Massachusetts tax-free weekend. Nothing fancy, but I can't wait to get the front-loading high-efficiency washer and dryer installed. The current appliances are all 70s era. The dishwasher runs but gets nothing clean. The fridge has the freezer on top and you can't find anything while you stoop down and search the fridge. The washing machine, which sits at the end of the kitchen, doesn't get anything clean and is hugely noisy (and last Friday right before weekend guests came the old hose sprung a fountain-like leak, so the kitchen floor got flooded for a few minutes and then was nice and clean!). And we don't even have a microwave. One great reason to get new stuff is that it's all energy efficient these days. 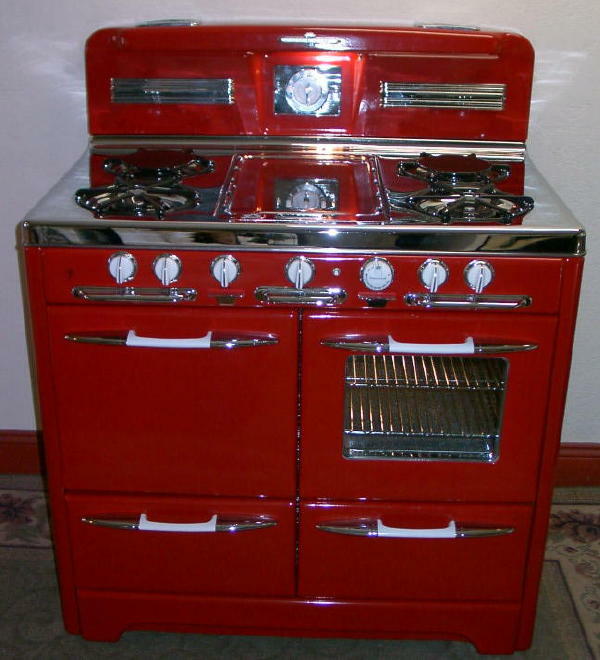 And next year when it comes time to remodel the kitchen, I think I'll look for a red stove, Hank! Our microwave, purchased a gazillion years ago when the oven quit [we couldn’t afford to replace the stove] and I declared we needed something to bake in, is the only exception. It’s a Sharp microwave/convection oven, so big it has its own cart to sit on. It works like a charm, heats up the stuff we want heated up and is like an old friend moving with us from place to place to place. When we were getting the appliances for this house, there were a few “I think I want” ideas: front loading washer [which was expensive, but I love it] . . . side by side refrigerator/freezer with water in the door [learned that lesson from the chest freezer where we could never find anything; didn’t care about the ice maker part, though --- it has one, but it’s filled with frozen food and everyone who comes by just knows I never have ice cubes] . . . fancy [but inexpensive] Maytag dishwasher that I love --- with stemware holders in the top rack and a “sanitize” cycle . . . .
By now, the appliance allowance for the house [something ridiculous like $1,500.00 for everything] had long been passed, so I settled on the stove. Words of wisdom from she who likes to cook: never, ever settle on the stove. I hated it from the moment we moved in and, after a couple of years of grumbling about it, my husband [probably tired of hearing me grouse and complain] replaced it with one from Whirlpool. Requirements: closed burners, self-cleaning oven. Check and check. The simmer burners and the power burner? Wonderful inventions. The fifth burner? A bit hard to use if you have big pots, but it has come in handy a time or two. Conclusion? I love this one as much as I hated the other one. Scratch and dent store! That's where we get our appliances. According to my husband, this is why refrigerator magnets were invented. I was a kitchen/bath designer for a year, my favorite job of all time, and something I would still be doing if the owner hadn't cracked up and lost the business. But it gave me the knowledge to completely redo our 1939 kitchen in 1999. We had a Kenmore dishwasher that had deteriorated so badly that it discolored all our dishes, and it sounded like an airplane landing when it was running; you simply could not be in the same room if you valued your sanity. I LOVE our Bosch dishwasher! It's super whisper quiet. You can stand next to it and not realize it's running, very efficient, and gets the dishes clean. What's not to like? And the basket doesn't have that crummy vinyl coating that breaks down and allows the posts to rust the dishes. The fridge we had then, though, died a couple years ago, and trying to replace it with something that fit in the same space was a nightmare. 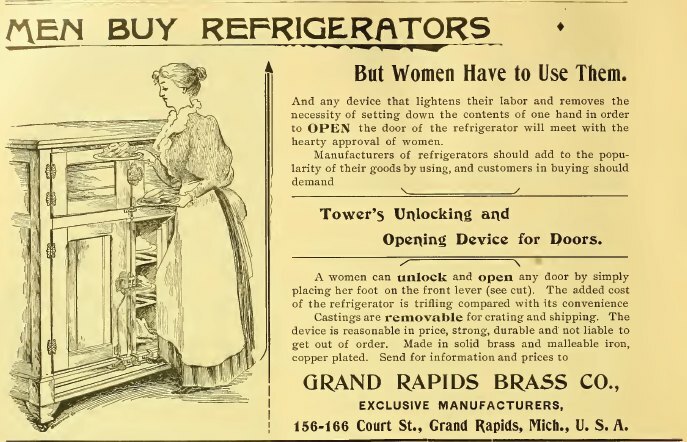 All the refrigerators are bigger now. Yuck. But I love the freezer-on-the-bottom LG. What a great idea. I already have a copy of the wonderful Slugfest! Our latest dishwasher is a Frigidaire….it is less than five years old….it is no longer working. In the past ten years, we have had three dishwashers. The first dishwasher which was our first one with a touch panel, would light up like a Christmas tree and turn itself on. This one was quickly replaced by our favorite appliance/hardware store in our town. The second dishwasher which was about three years old did the same thing, only this one began smoking and was going to catch on fire, thank God our son was home ad he was able to turn the power off at the junction box. When the repairman came to check it out, he said that these dishwashers didn’t like water. WHAT??????!!!!! Now we are on to our third dishwasher in less the ten years. We will get another one at our favorite appliance store, have them install it, and then call the priest to exorcise it. Appliance shopping for me is going into Sears and going to the cheap end of the row and when the salesperson tries to move me to the other end of the row I dig my heels in. The more bells and whistles the more things there are to break. And you've never seen a crazier person than me when it comes to surprise big ticket repairs or replacements. (It is not pretty). Maybe if I had a bigger kitchen and spent more time in it, but as it is now I'd rather spend the little bit of retirement money I get on other stuff - like books. and going to book cons . . . 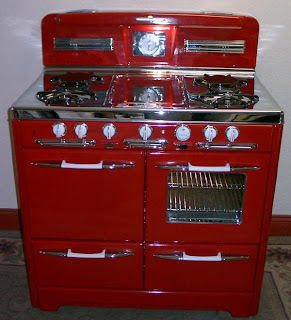 ALTHOUGH, i have to say - Hank, I covet your red stove! Sears was my first stop and I was shocked at how expensive things were - and they did have appliances in all price ranges but even the Kenmore Elite line seemed pricey to me. Go figure...I've paid $50 to have someone blowdry my hair but can't cross the price threshold on certain things. I do have a subzero in my apartment and it was presented as a selling point. It's huge and is filled with - condiments and the sauce packets from Chinese restaurants. That apt also has Bosch dishwasher (the old ones are better than the new) and Jenn-Air stove. I do nothing there but change clothes and occasionally order in - wish I could move them to CT. Since you're all dying to know...I went with the GE Cafe fridge, and stove, Kitchen Aid dishwasher. Aberto will be disappointed but hey...I can show him my pricey handbags. I, too, go for Kenmores, the cheap, basic ones. They last a long time, don't break down often, and can be repaired cheaply. When I replaced my stove a while back, I opted for self-cleaning, something I would recommend. I'm going to have to replace my refrigerator, which is still chugging along after 29 years and two repair calls, and my dishwasher, which has been gone for years. And I've got a new Kenmore washer and dryer coming. My sister bought one of the new ceramic-cooktop stoves. Within a year, she had trouble with two burners, and the cost to replace them was so high that she just uses the other two all the time. When I was a young wife and mother, my first husband spent my stove money on a state-of-the-art (8-track) stereo system when we bought this house. So for three years, I cooked three meals a day for a family of four on a hotplate and a toaster oven, including his college graduation party with dozens of enchiladas and tamales, carnitas en chile, sopa de arroz, and homemade tortillas. After that, I'm just happy if I've got a real stove with real oven. Consumer Reports checked every time.. And did you know Sears has 'scratch & dent' stores? Most dishwashers have a reversable panel on the front.. usually black/white. You can paint your fidge with blackboard paint from KILZ... Mom had a JennAire cooktop for 40 some years... still working! Have had to replace knobs because the 'hi-low' stuff wore off and replaced grill plates once. All I will say is thank goodness for the kind repairman who LENT us a range (oven + stove) that he was supposed to destroy b/c it had a scratch on top, for SIX MONTHS after he tried for hours to repair the electronic gismos on our old oven. (Even the replacement boards wouldn't work.) He knew we were getting ready to remodel the kitchen but couldn't buy a new range until we had the remodel plans finalized. Needless to say, we recommend him when ever possible. I bet he'd even come to Dallas to work on Debs' d/w drawers! Ro, we bought GE Cafe and are very happy with it. Except the dishwasher. :) But we LOVe the fridge and the dual fuel range (gas burners, electric oven). 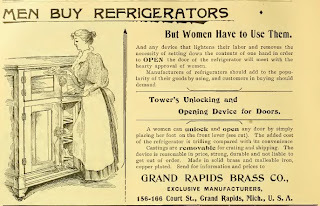 That is the appliance envy I DO have. I want a refrigerator with the freezer on the bottom. But I think it's funny we all have such strong opinions about our kitchen appliances. It clearly strikes some sort of emotional chord. Sort of like the way men get when they call into Sports Talk radio stations. Leslie, thanks, but I have my own in-house repair guy. He does, however, swear a lot, especially when taking apart things like the KitchenAid double-drawer dishwasher. And does anyone remember the picture I posted on FB last winter of the washing machine disaster? We'd replaced our 14 year old Kenmmore with a Whirlpool Cabrio, which lasted maybe six year... Rick completely took it apart--it looked like a bomb had gone off in our bathroom. Turned out the part that needed to be replaced cost as much as a new washer. Verdict? Trip to Lowe's. New Samsung energy efficient top-loader. We love it. We have an ice-maker but fill it with store-bought ice because we like it better. And I have one other thing to say: Gas. Gas. Gas. I learned to cook on an old gas stove in college and didn't have gas again until we moved into this house seventeen years ago. If you like to cook, you can't beat a gas range. Linda, I want that meal you prepared for the party!! And debs--your hub does computers and appliances? what a catch! My dryer is Kenmore--almost 28 years old and still working. My refrigerator is a Fridgidaire as is my stove, which is only 24 inches wide--long story. Yes, I can cook everything I've ever needed to cook including a very large turkey. And prepare to be shocked. I don't have a dishwasher. Never have had. My stove stopped working after eighteen years of devoted service. The oven temperature gauge did not reach maximum capacity and all my chicken dishes became anemic looking. I picked out a moderate priced oven and I am happy. My refrigerator is stainless steele. I have replaced my dishwasher many times. But I pay homage to these items because without them I am nothing, I tell you..nothing. Scratch & Dent...who knew/ And then I was out doing errands this morning and I see a HUGE banner, S&D showroom. had to check..I got good prices on mine! Debs,cannot imagine my husband taking apart our dishwasher unless you mean smashing it with a mallet. Darlene - I don't have a dishwasher either. But it's the first time in many years. Maybe that's why I'm not doing as much cooking. We had planned on having one installed when we moved into this little house - 16 years ago. I've lived a lot of places and I loved my old freezer on the bottom fridge. I love the red stove, and I'm not sure that that marble and stainless steel evokes a warm cozy kitchen, but that's just me. Wow, this topic rang a lot of bells. I'll keep my comment to one (of many) stupid remarks I've heard from clueless salesmen. Always men. Me: I don't want that model of stove; the dials are all down low, where little children can reach them. Mr. Stupid: Children don't belong in the kitchen. My biggest kitchen appliance nightmare is the stove. Three burners don't work, but I can't reach the knobs anyway. I got a knob-turner-reacher thingy. That works pretty well. The last working burner is slowly losing it's workability factor, so I will soon be on the lookout for a new stove. I'm looking for the cheapest that has accessible knobs. My other appliance nightmare is the refrigerator. It still works, but the thing I like about it most, the ice water dispenser, is broken. At least the ice cube maker works. I hope I didn't just put my grandmother's curse on it by saying that. I would cry over losing my ice cubes. Magnets, Hallie - a must. I can't believe I thought magnets stuck to stainless steel. You hit a nerve with me! Dishwasher, refrigerator and air conditioner all went this summer, and they are less than 8 years old!! Here's my nightmare...knobs. Why can't I find knobs for my stove that fit? Coming in late to this, but oh, don't get me started on the cost of repairs! I now check the internet to see if I can do it myself, after having been burned by once trusted repairman, who charged $60 to tell me that I accidentally pushed up float in dishwasher. Took him ten seconds to fix and he was out the door with MY money! Since then, I have so far repaired: dishwasher (twice), Whirlpool Duet clothes washer (replaced solenoid valve, as machine would fill with water when shut off--not fun with front loader!) and blocked drain hose, ice maker on JennAire fridge, and daughter's boyfriend's 4s iPhone broken screen. After the door on my dishwasher fell off, we bought a (running out to look...)KitchenAid. Only 5 years old, and already starting to fall apart. The top rack, adjustable (and it seemed like a good idea at the time) broke, so that it won't wash anything. All the plastic screws holding it together are breaking due to heat. The part to repair (large bracket thingy) online was $100. I pulled out the top rack, took the whole thing to Lowe's, and rigged it with metal brackets that won't melt on both sides (as the other side was starting to go) for 3 bucks.